Is Bulgaria's property rebound beginning? 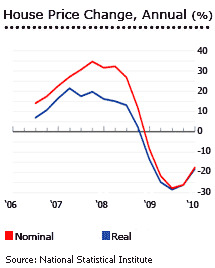 House prices in Bulgaria continued to fall in Q3 2010, albeit at a slower rate. Although economic growth has returned to Bulgaria since Q2 2010, it is at a snail’s pace, not enough to dent high unemployment or push up consumption. The average price of existing flats in Bulgaria dropped 6% to BGN960 (€491) from a year earlier. The relatively small price drop is a significant improvement on the more than 20% price falls experienced in 2009, and the 17.8% decline during the year to Q1 2010, according to the National Statistical Institute (NSI). Average prices at Q3 are 32% below the peak two years earlier (BGN1,418 (€726) per sq. m.). During the house price boom, residential property prices in Bulgaria surged by around 300% between 2000 and 2008. The situation looks better in Sofia, the capital city. For the first time since Q3 2008, the average price of existing dwellings rose by 2.2% q-o-q to Q3 2010. However, the average price of BGN1,593 (€815) per sq. m. was lower by 2.9% from a year earlier. Of the other 27 provinces, six registered positive annual price changes in Q3 2010; including Sofia Province with an impressive rebound of 22.2% increase. On a quarterly basis, house prices in 11 provinces posted increases. Bulgaria’s GDP rose 0.3% seasonally-adjusted q-o-q to Q3 2010, after a 0.5% expansion in Q2. From a year earlier, the economy expanded 0.2% in Q3 after a -0.3% in Q2 and -0.8% in Q1 2010. The over-all change in GDP for 2010 is expected to be around -0.5%. Economic growth is expected to accelerate in 2011, with a GDP expansion of 2.6%. Then 3.2% growth is likely in 2012, according to the European Commission. Unemployment is expected to climb to 9.8% by the end of 2010, from 6.3% in 2008 and 9.1% in 2009. Unemployment is anticipated to ease slightly to 9.1% in 2011 and 8% in 2012.